"October. This is one of the peculiarly dangerous months to speculate stocks in. The others are July, January, September, April, November, May, March, June, December, August and February." I can buy stocks when they are cheapest, just before prices shoot up. I can sell stocks at their peak, just before prices come crashing down. This is the basic concept of market timing: moving your money in and out of the market, being fully invested when the market is rising and out on the sidelines when the prices are falling. The problem with trying to time the market is that it can’t be done reliably or consistently over time. Extensive research shows that typical mutual fund investors perform much worse than the mutual funds they invest in. This is because they tend to buy after a fund has done well, and sell after the fund has done poorly. They are buying high and selling low – a recipe for poor performance. - John C. Bogle, founder of Vanguard. Most likely the market timer is out of the market when it's at the very bottom and going up, missing the best part of the returns. Getting out of and then back into the stock market is not free. There are taxes and investment expenses involved if you’re playing with money in your taxable account. Every time you move money around, you will always pay taxes on your profits. You may also be responsible for trading costs or sales charges with each purchase. What if you pull out of the stock market when you think prices will come down, only to find that you have missed out on a historical run? What if you spend significant amounts of money to buy into the market when it is losing money, only to find that the market is continuing to lose more money? The stock market does well on average. Over time, the stock market always goes up. It does just as well whether you are out of the market as when you are in it. 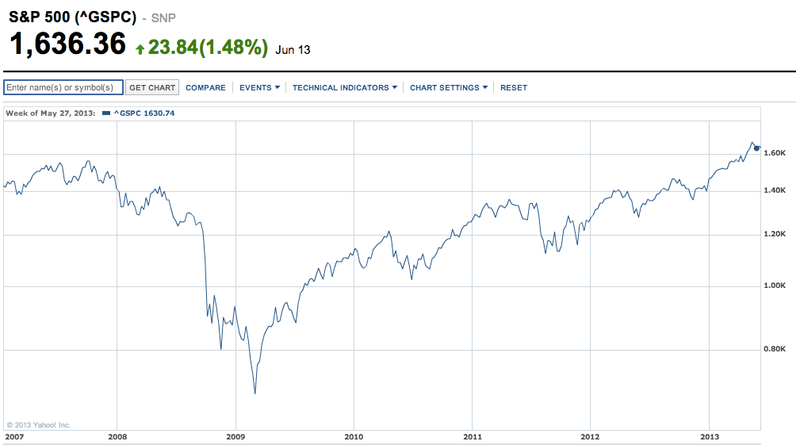 As it turns out, the best returns on the stock market have happened in only a few months. The returns on the very first few weeks of a market recovery produce a large proportion of the total gains that will be experienced. Simply buying and holding your investments is more likely to outperform market timers with a lot less headache along the way. Your investment losses will recover. When the stock market is losing money, this is your time to pick up more shares at cheaper prices. Stocks can be volatile with up and down swings, just like a rollercoaster. When you’re riding a rollercoaster and you get scared, you should hold on tight, not jump out of your seat. Invest early and invest often. If you have a large sum of money that you would like to invest, you can consider using an investment strategy called dollar cost averaging. With dollar cost averaging, you invest equal amounts of money regularly over a specific period of time, instead of all at once. For example, instead of investing $5,500 into your IRA all at once, you can invest $458 a month for 11 months and $462 for the last month. When you invest in this manner, you purchase more shares when prices are low and less shares when prices are high. The total average cost per share is lower over time. Investing this way will reduce the chances of putting all your money in just prior to a market crash, which could take longer for you to regain your losses. There are downsides to dollar cost averaging. Let’s say the stock market is on its way up. Investing in increments and not all at once will prevent you from having the most amount of money working for you right now, instead of in the future. Many investors will be investing as they earn, so they are naturally already dollar cost averaging. If you receive a windfall of money such as an inheritance or a work bonus, you can choose between lump sum investing versus incremental investing. Just don't worry too much about trying to time the market. And that’s it for today! We’re now getting close to the end of my investment series of posts. In my next article, I will talk about getting started with choosing your investments.